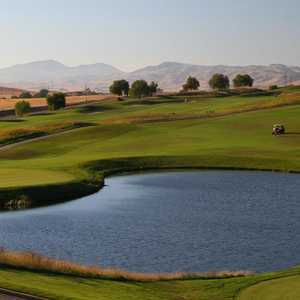 LIVERMORE, Calif. -- What is Greg Norman's first golf course design in the continental United States? The Course at Wente Vineyards weaves through vineyards, goes up over a ridge, and drops down to more vineyards. Which course played the toughest relative to par on the Nationwide Tour from 2005-2007? 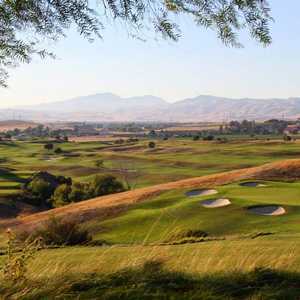 The answer to both questions is The Course at Wente Vineyards, a sprawling multi-dimensional layout 45 miles southeast of San Francisco. In 18 holes you go from sycamores to chardonnay, and in the process experience a mix of short and long par 4s and par 5s that have proven to be not only challenging but also fun. The course is more than 7,100 yards and has an eye-popping slope rating of 145. Omar Uresti won the Nationwide Tour event here in 2007, when weather and course conditions combined to push the stroke average to 75.5. That's why first-timers -- even single-digit handicappers -- might want to take this course from the blue tees, which measure out at 6,266 yards for a slope of 131. The gold tees total 6,837 yards and the slope jumps to 141. For women and seniors, the white and red tees measure just less than 5,300 and 4,900 yards, respectively. It takes a little time to get to the first tee from the clubhouse (carts are all but mandatory here), and the hole isn't easy, either. The 405-yard par 4 (from the blue tees) is as straight as a highway and has no bunkers, but it's one of the most difficult on the course. The next hole, a par 4 that measures only 286 yards from the blues, puts you in a pocket of giant, white-trunked sycamore trees. It invites the brave to test it with a driver from the tee. Yet its narrow fairway and small green make a 5-iron, pitching-wedge combo another option. From there the holes weave through vineyards, go up over a ridge and drop down to more vineyards. The uphill par-5 eighth is deceptively long even for those who love to go deep. After the ninth, you ascend to a cart path that would make a great mogul ski run. The 10th is another drivable par 4, and from there the course works through natural terrain. The par-5 12th, which usually plays into the wind, ate up the Nationwide Tour pros in '07. From the back tees it means a forced carry off the tee and a second shot to a blind downhill fairway that leads to a large, tricky green. After a short par 4 and a medium par 3, holes 15 through 18 return to flat ground. The 18th maxes out to more than 450 yards and features a fairway bisected by a creek and a greenside lake. Norman creates courses most mid- to high-handicappers would find difficult. At Wente Vineyards, fairways are fairly generous, but precise approach shots are needed to score. The well-guarded greens are deceptively sloped. The routing works its way through various small valleys that make knowing where the low spots are rather sketchy. Take note that in the wet winter and spring months the rye grass in the rough can get extra thick, which makes long iron or utility club shots quite difficult. At the same time the course has won local awards as the best maintained in the area, so in drier months conditions can be firm and fast. 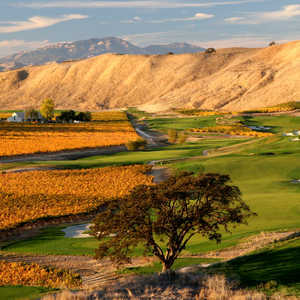 For the better golfer, The Course at Wente Vineyards isn't intimidating as much as mystical. Misread slopes make for three-putt greens; missed approaches mean tough up-and-downs. But for all golfers, it's a true delight for the physical splendor throughout. "The course will not give you much of a break if you stray; that said, if you think about your game a bit and hit your shots, it will reward you," said Vince Golla of nearby San Ramon. "The first few holes on the back nine will take your breath away -- both physically and visually. Regardless, I'm always rewarded by one of the most visually stunning courses you can find in the Bay Area." A full driving range is included, though it is located about a quarter mile from the clubhouse, which is where the practice putting green is. Group and individual lessons are available. In the summer, Livermore can get quite warm. Oddly, however, the golf course can get quite crowded during the afternoons because the adjacent winery and restaurant hosts a series of concerts that attract thousands. Golf and music is a great double if you can manage. There are plenty of hotels in Livermore, though, about 10 miles away at the intersection of highways 580 and 680 there are more, including a Hilton and a Marriott. The on-site Wente restaurant ranks among the best in the region, and Wente is the largest among the 20-or-so local wineries.